You might get a bit annoyed when you notice the contacts in your Google account automatically set to “follow” status in the new Google Social network, Google Buzz, without your prior consent. You might not want your social circle to be widely exposed or you do not want certain people from your contact list to be included in your social networking. To overcome this problem with Google Buzz, initially users need to go to their Google Profile to make changes on the setting or disable and turn off Google Buzz manually. However, due to technical and security issues , Google’s engineers have made changes and now only allow users to do quick edit and disable Google Buzz through the “Settings” feature in their Gmail. 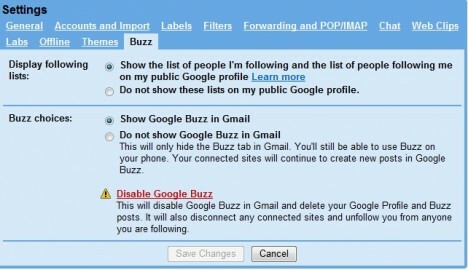 To edit the setting or fully disable Google Buzz, users just need to go to the “Settings” feature in their Gmail and select the Buzz” tab to start editing. Users can choose whether to display the list of people they are following in public, show Google Buzz in Gmail or disable Google Buzz completely in their selection. Once it is done, users just need to click “Save changes” to save their setting.